We spent over 30 hours testing 15 different archery targets and found that size options, durability, and portability were the most important features consumers seemed to focus on when looking to purchase. The Morrell Double Duty Archery Target scored high marks above the others in all categories we compared and is our overall top pick. This quality archery target provides a target that is strong and durable and can handle thousands of hits from crossbows, airbows, and compound bows. The replaceable target cover allows for longer core life and the graphics are bright and easy to see. This freestanding cube target requires no target stand. There are a large number of archery targets on the market to choose from as well as some really great companies that manufacture them. Finding the right archery targets for your needs can be daunting if you are new to archery and don’t know what the different targets offer. Not all targets are created equally so it is important to understand the features that make one archery target better than another. Regardless of whether you are interested in archery for the first time and are just getting started or you have been shooting for a while you will need archery targets to shoot at. Making sure that the targets you purchase are of good quality and tough will ensure that you don’t waste your money on cheap ones that have to be replaced frequently. We have put together reviews of three top rated archery targets that are available so you can learn more about them. These three targets are high quality, durable, strong, and brightly colored for easy sighting. We have also provided you with an informative buying guide that will give you all the knowledge you need about archery targets so you can choose one that will meet your needs. 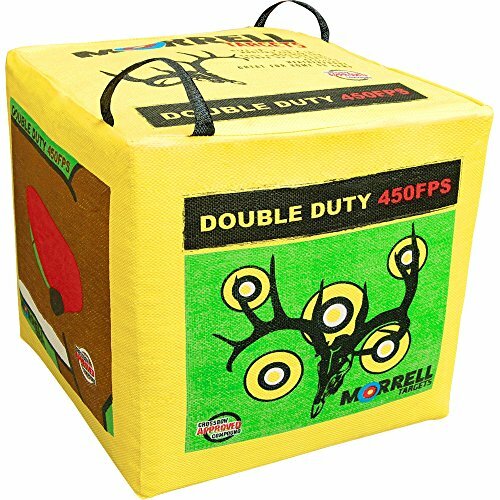 The Morrell Double Duty archery target is the perfect target to handle tons of abuse from airbows, crossbows, and compound bows. Arrow removal is very easy and you’ll get longer core use as well because the Double Duty can handle literally thousands of hits from the bows mentioned. This tough target can even handle a shot from the fastest known arrow flight, the 440 FPS that is shot from an airbow. You can replace the target cover as needed so your Morrell archery target will last for years. Carrying it around is very easy thanks to the carrying handles that make this target very portable. No target stand will be necessary with this model. The bright graphics make the targets easy to see when you are in the field. If you are a serious archer, this is the archery target for you. The RinehartA broadhead target is the perfect target for archery practice and can handle tons of hits without losing integrity or shape. This unique 18 sided target offers archers plenty of challenging targets to practice with. This lightweight archery target is very portable and can be taken to any field you choose including but not limited to the backyard, archery club, or a hunting camp. The self-healing foam keeps its shape after the arrows are removed. It doesn’t matter whether you are shooting field points, expandables or broadheads, you will have a long lasting target that will provide you with the kind of quality practice you are looking for. The RinehartA comes with a full year guarantee. Morrell is a trusted name in archery targets and creates numerous high quality products for archers of all skill levels. 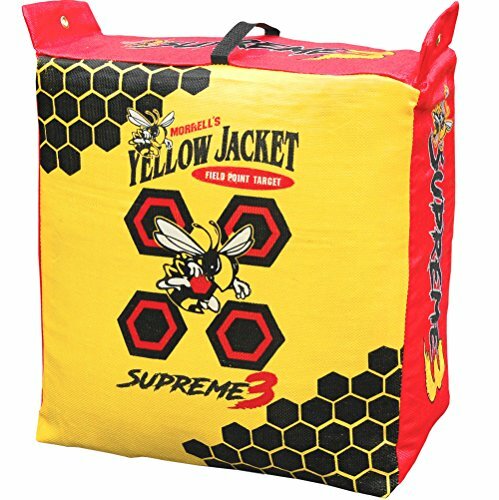 This Yellow Jacket Supreme 3 field point bag archery target is popular for its two finger arrow removal. The cover of the target is replaceable so you have a long core life of the target that can last years and years. The convenient handle makes for super easy portability and transport. This free standing target does not require a target stand so you can take it anywhere you want to practice. This durable stand will handle thousands of hits from compound bows without losing shape or integrity. Grommets are present so you have the option of hanging the target if you choose. The three top rated archery targets featured above and some of the most popular, durable and high quality archery targets on the market today. Each one provides archers of all skill levels with challenging targets to practice with. They all feature easy remove arrows and replaceable covers that extend the core life of the target. Another popular feature of these archery targets is their portability and lightweight so they can be carted anywhere you want to practice. Taking the time to improve your shooting skills by purchasing high quality archery targets will ensure that you have targets that will stand up to tons of shots from all kinds of bows. Once you are ready to purchase an archery target or two, you may be surprised at the number of targets there are on the market. The large number could easily overwhelm someone who is not familiar with targets or how to determine a cheap one from a high quality one. If the three top rated archery targets we have reviewed for you are not quite what you are looking for, we have listed 7 other archery targets that you can consider. There are several different types of archery targets for archers to choose from and they work for all skill levels. We have listed each type below along with some information about each of them. Consider getting more than one type of target so you can have different styles of practice as well. These popular targets can be seen everywhere and are easy to identify. The rings are perfect for newbies and provide plenty of opportunity to improve your accuracy. Since the bulls-eye is your primary goal the way to understand the traditional target is that each ring is a degree of miss and will help you understand how far off of the bulls-eye you are. This traditional style archery target makes measuring your own improvement very easy. When you practice and see that your arrows are all over the target in different rings you’ll need to expect to practice more to improve. If all of your arrows are clustered in the yellow and red rings your skills are definitely improving. Other types of targets may not make it so easy to measure your success. 3D Targets – 3d targets will usually look like different game including elk, turkeys, ducks, deer, etc. Although they are very fancy and expensive, some people like having that realism when they are practicing. These expensive specialized targets are designed to teach hunters and would-be hunters to zero in on the organs and learn to shoot while targeting a spot that eliminates any suffering the animal might have. If you plan on doing any bow hunting, you may definitely want to practice on some 3D targets. Bag Targets – Bag targets for archery are fantastic options for newbies. They are easy to transport and lightweight so you can take them anywhere you want to practice. These bag targets are mostly all-weather proof, durable, and will stand up to lots of use by even the high powered bows. If you want more of a challenge, try a smaller traditional target. This smaller surface requires much more accuracy to hit so you will definitely be improving your skills by practicing with one. Bag targets are some of the most popular targets for archery available. They’ve improved and evolved tremendously over the years. Cubes – These targets are easy to identify due to the unique dice-shape. A good example of this is the RineheartA 18 to 1 target that is reviewed above and one of our top rated archery targets. One of the popular features of this target is the fact that it won’t move around much while you are trying to practice. 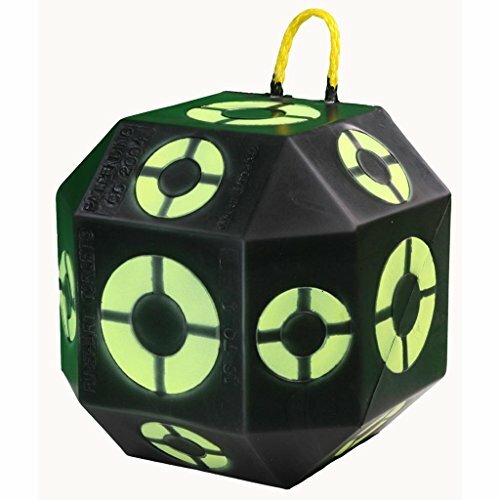 Sometimes the dice-shaped targets have 6 sides and other times they may have as many as 18 sides. Cubes and other irregular shaped targets allow archers to shoot from different angles so they can work on their weaker skills. This is especially important for those who intend to do bow hunting. Now that you understand the different types of targets on the market you can learn some of the features that you should look out for and things you should take into consideration before purchasing. Self-healing – A self-cleaning archery target is one that takes care of the cover and core. A self-healing target is made of foam or rubber and it collapses in on itself as the arrow permeates the structure. As you pull the arrow out the surface of the target looks like it hasn’t been shot into at all. This is an excellent feature that many people love because it allows the target to last much longer. Sturdiness – The tougher the archery target is the better it will perform. A wimpy, cheaply made target will be more of a frustration than good practice and it will get beat up very quickly, requiring you to purchase new ones. The cube targets are very stable and allow the archer to move around them and change the angle that they are shooting from. Bag targets are just as sturdy although they can move a bit whereas cubes are usually very stable and solid. Removing Arrows – You want your arrows to sink into the target solidly but you don’t want the fletchings of the arrow to get ruined. No archer wants to fight with an arrow to try and get it out of the target but this happens all the time. Look for targets that advertise easy arrow retrieval or removal. Some even say they offer two finger removal which means removing the arrows from the target almost come out on its own. Arrow Security – Make sure your archery target does not ruin your arrows. This can happen by the target’s material damaging the shaft, fletchings or arrow heads. Another way for the arrows to get ruined is to use a target that is too small, causing the arrows to group too closely thus damaging each other. Size – The size of your target will depend a little bit on the type of bow you are using. Recurve bows, for example, are typically harder to shoot properly so choosing a larger target will help improve your accuracy. If you will not be using a scope or sight of any kind, look for the largest archery targets you can find and work your way down to smaller, more challenging targets as your skills improve. Grommets – Grommets are little holes at the top of an item that you can pull a string, cable, or rope through so it can be hung up. Many bag targets have grommets so the bag can be hung from a tree of post. A lot of the higher quality archery targets have grommets built in so you can hang them if you choose to and don’t have to worry about making a hole. If a bag target has a grommet it will be stated in the description. Purpose – Before you purchase a target make sure that you know what kind of archery you want to do and what kind of bow you will be using. This information will affect your choices because some targets are better suited to certain kinds of archery than others. Once you know what you will be using the target to practice for you will be able to choose the right practice target easily. Warranty – Many of these high quality targets come with warranties that assure buyers that the product is a quality one and that the company stands behind their products. Warranties for archery targets are not typically long term, usually one year or so, but they are important to have in case you get a defective one or one that has problems early on in its use. Price – Archery targets range in price from the extremely inexpensive to the very expensive. Before you start browsing, set a budget for purchasing your archery targets and then stick to it as closely as you can. Don’t look at price as the only consideration. Getting a deal is fine but choosing a target simply because it is cheap is a good way to completely waste your money. A good rule of thumb is to purchase the best archery target that you can afford to. Archery targets are a great way to improve your archery skills no matter what type of archery you are engaging in. There are many different types of targets on the market ranging from cubes to bags to the traditional bulls-eye that everyone recognizes. These targets have a variety of angles you can practice from and also have different point systems they offer as well. The three top rated archery targets we have reviewed for you here are all excellent choices that work well for archers of all skill levels. Even a newbie to archery can get a lot of improvement in their skills by choosing one or two quality targets. Consider getting a couple of targets in different styles such as one cube and one bag so you get used to shooting at a variety of targets. This will help you a lot when you are doing any kind of serious shooting. When you start the process of looking for the right archery target or targets for your needs, start by looking at these three top rated choices to see if any one of them is what you are looking for. If not, check out the other suggestions and make sure that you have read the buying guide that will walk you through the features to look for and what to consider when you are sorting through a large number of targets. This information will make sure that you understand what makes a good archery target and how to avoid purchasing one that is made cheaply. You want to spend your money on targets that will hold up under a large volume of hits while maintaining its shape and performance. Don’t forget to factor in self-healing which helps to preserve the life of your archery target. It is this understanding and knowledge that will allow you to make a confident decision that you will get a lot of practice from as well as enjoyment.